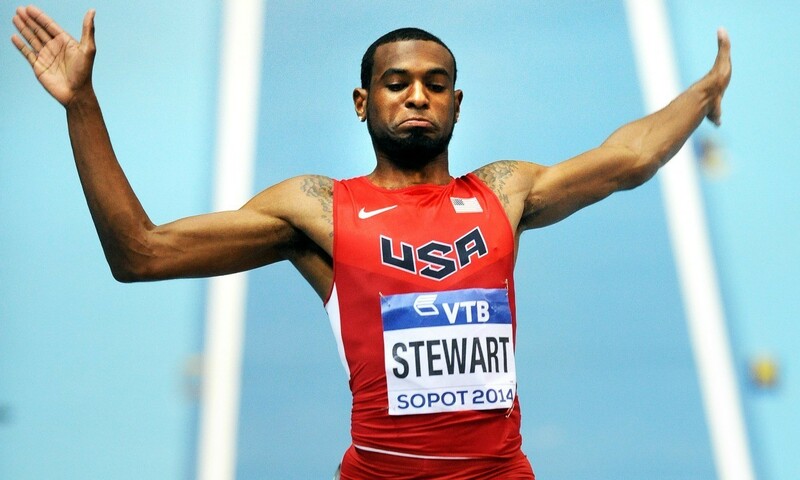 Tyron Stewart is a new generation of jumper at the US Olympic Training Centre in Chula Vista, California. He has made major improvements as a member of the resident programme and since graduating from Texas A&M. Under the watchful eye of coach Jeremy Fischer, the 2011 NCAA triple jump runner-up is now beginning to emerge as a contender at the long jump on the world stage. Stewart’s indoor season was the culmination of two years of development at the centre and his US indoor title, although a big breakthrough, was only the beginning of better things to come. Though only ninth at the IAAF World Indoor Championships earlier this year, 2014 has seen his indoor PB improve to 8.22m and outdoors his best now stands at a very healthy 8.39m. Fischer has a high-class stable of notable athletes that includes Britney Reese, the 2012 Olympic champion and the 2013, 2011 and 2009 world outdoor and 2012 and 2010 world indoor champion, and Will Claye, the 2012 Olympic silver medallist at triple jump and bronze at long jump, the 2013 world outdoor bronze medallist and 2012 world indoor gold medallist at triple jump. In his eighth grade he moved to Texas and promptly quit track in his ninth grade to concentrate on football. A year later a friend convinced him to return to track. Stewart’s 8.39m leap at the OTC High Performance Meet was the furthest jump by an American for two years. Since a 7.92m start back in January of this year, Stewart has progressed by more than 40cm and is on pace to join the elite of elites in the 28 foot club (8.54m). His agent, Kuba Wasowski, adds: “I have watched Tyron develop since 2012. He is one of those athletes that you just know has the potential to be a world or Olympic champion given the right conditions. Monday: Warm-up, approach work, acceleration work. Olympic lifts. Tuesday: Warm-up, short approach jumps 6-8 total steps. 5x150m, static lifting. Wednesday: Recovery day, yoga, circuit training. Thursday: Warm-up, technique work, long jump drills. Max velocity sprint training, mixed lifting – Olympic and static. Friday: Abbreviated warm-up, plyometric training, hurdle mobility training. Saturday: Active rest: pool, bike ride, elliptiGO.